At a time when everything is digital and people are moving away from analog as fast as they can, Pro Tool Reviews is doing the complete opposite. 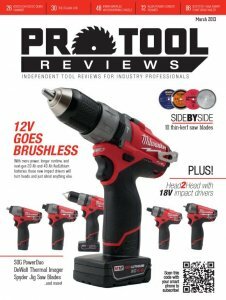 Pro Tool Reviews, just like a lot of the new-media, started out on the internet, but now they are coming out with an actual printed magazine. You might be asking yourself why—and I asked myself the same thing—though I also admire them for taking on such a task where many others have failed. So, why? Because they feel there is a void that they can fill. You have an emotional connection with something you can actually hold versus pixels on a screen. Maybe you don't subscribe to magazines, so you don't know the excitement you get when your freshly printed magazine arrives in the mail, but it's that same feeling you get when the latest Lee Valley catalog comes in the mail. Subscribe to Pro Tool Reviews Magazine and you will get a full 12 issues a year that are packed with a hundred pages of professional reviews, photos, tool shoot-outs and more. If you're a tradesman or contractor you're going to want this magazine. If you're a do-it-yourselfer or hobbyist, this magazine will teach you how to know what makes a tool great—and what you should avoid. PTR doesn't pull any punches and you can learn a lot from our writers—each of them real tradesmen who REALLY know their tools. Of course we wish our friends over at Pro Tool Reviews success with their magazine, just don't forget to come visit little ol us.